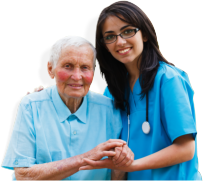 New Life Home Health Care LLC is dedicated to providing the most qualified personnel to the patient/client in his/her own home in order to maximize and fulfill his/her goals as a member of the community. Our services are available 24 hours a day, seven days a week using an answering service and on-call procedures after normal working hours, weekends and holidays. As needed, staff may be assigned to make patient/client visits after normal business hours. We offer skilled nursing services and Physical Therapy, Occupational Therapy, Speech Therapy, Medical Social Workers Services. Registered Nurses (RNs) provide quality nursing care by the visit or the shift. The highly trained professionals follow your physician’s orders, monitor and instruct the patient/client regarding your care. Specialized therapies as IV antibiotics, chemotherapy and total parenteral and enteral nutrition are also provided by the RN. The Licensed Practical Nurse (LPN) provides assigned nursing care under the direction of an RN. The LPN is supervised by the RN at least monthly. All RNs are licensed in Michigan and follow all regulations and standards of practice required. All LPNs are licensed in Michigan and follow all regulations and standards of practice require. Our agency does not provide psycho-active treatments. Our Home Health Aides (HHA or Aide) provide light housekeeping, meal preparation, shopping and personal care for the patient/client. Physical Therapy, Occupational Therapy, Speech Therapy, Medical Social Workers Services. If the agency provides these services, they will be provided as ordered by the physician to enable the patient/client to receive restorative therapy and social work and nutritional intervention as needed. They are provided through contract or directly. These services will be provided as ordered by your physician to enable you (patient/client) to receive restorative therapy and social work and nutritional intervention as needed. To request home health care services in your area, please call 800-248-0609. We always welcome the opportunity to help you improve your health at home. New Life Home Health Care LLC is available to provide care services 24 hours a day, all 7 days of the week. You may also arrange for health service schedules during Federal Holidays.